1. How do I reserve my cabin? 2. What information will I need in order to book my cabin? 3. How much do cabins cost? 4. Can I book a cabin as a single passenger? 5. I don’t want to go by myself, can MOR Cruise Team arrange a roommate for me? 6. Do I need a passport? 7. What does the price include? 8. Are there any discounts available? 9. What is the payment schedule? 11. Can I make changes to my reservation or transfer my cabin to another party? 12. How do I make a payment? 13. Can I go on the cruise if I’m pregnant? 14. Do I need travel insurance? HOW DO I RESERVE MY CABIN? Reservations open on Wednesday, April 11th at 1 pm Eastern to Alumni that sailed in 2018 and then Friday, April 13th at 1 pm Eastern for all past MOR Alumni. These guests will be sent personal booking links. Booking will open to the General Public on Wednesday, April 18, 2018 at 1 pm Eastern and must be booked through The Monsters of Rock Cruise by clicking HERE or calling us at (855) 505-6672. If you have any customer service related questions, please contact the Monsters of Rock Cruise Team at reservations@monstersofrockcruise.com. Please DO NOT contact Royal Caribbean to book this reservation as this is a charter and all reservations must go through our reservation center. Please refer to the Deposits & Cancellations for further information about passenger name changes, transfers, and other pertinent information about your reservation. If you are paying with multiple credit cards, you will need all of the credit card numbers complete with expiration dates and card verification numbers as well as the billing address, phone number, and email for each card. Up to date pricing per person can be found on the PRICING page of our website. CAN I BOOK A CABIN AS A SINGLE PASSENGER? Yes, please contact us for our single rates. Generally, our singles pay double occupancy fare. Single occupants are still responsible for the mandatory government taxes, fees, and pre-paid gratuities of $285 for one (1) guest. I DON’T WANT TO GO BY MYSELF, CAN THE MOR CRUISE TEAM ARRANGE A ROOMMATE FOR ME? Please be advised that these pages have been set up by Monsters of Rock Cruise fans and not by The Monsters of Rock Cruise or On The Blue. Therefore, choosing to room with someone you do not know is at your own discretion and neither The Monsters of Rock Cruise, OTB Cruises, LLC or RCI will be responsible or liable for any issues related to these matches. Any problems associated with cabin mates (both on board or during the reservation and payment process) will be subject to the same terms and conditions as any other cabin and the main passenger on the reservation will be held responsible. If you are looking for a cabin mate for MOR 2019, CLICK HERE. If you do not plan to travel with a passport, PLEASE CLICK HERE for a complete explanation of the travel documentation required. Please understand that this is a U.S. Customs requirement and is not in the hands of those at Royal Caribbean or The Monsters of Rock Cruise. Passengers without the proper documentation will not be permitted on board and no refunds will be issued in these circumstances. NO EXCEPTIONS. *Please remember that this allowance could change at any time by CBP and all guests would need to comply. Roundtrip, 5-night Monsters of Rock Cruise from Miami, Florida aboard Royal Caribbean’s incredible Mariner of the Seas! Two exciting ports of call, Ocho Rios, Jamaica and the private isle of Labadee. All meals in the Main Dining Room, Buffet (includes regular coffee, tea, juices, non-carbonated beverages). Complimentary Access to Fitness Center, Pools, Jacuzzis, Decks/Deck Chairs, Casino, Disco/Night Club & More! Incredible Hard Rock and Heavy Metal Concerts, Events & Activities . . . the action never stops! All cabin fares include: All talent/entertainment related fees, your accommodations on-board the ship, all meals in the main dining room(s) and cafeteria, other casual dining throughout the day, non-carbonated beverages (coffee, tea, juices, etc. ), use of the ship’s pools, health and fitness centers. * Your base cruise fare does NOT include government fees, taxes and pre-paid gratuities, these mandatory charges will be added automatically to your reservation at the rate of $285 per person. In addition, the following are NOT included: Fuel surcharges, transportation to/from ship, shore excursions, sightseeing or meals ashore, meals in specialty and à la carte restaurants, room service, laundry, wine, beer, liquors, cocktails, soda, mineral water, bottled water, medical expenses, spa treatments, beauty salon, casino gaming, onboard shopping, travel insurance or any other items of a personal nature. In an effort to reduce costs even further for our Monsters of Rock Cruise family, we will offer a Paid in Full Discount for the 2019 cruise. When booking your cabin, you may select the Paid in Full option during the booking process and receive a 5% cabin discount (base cruise fare only) on the purchase of your cabin. Full payment must be received within 72 business hours of booking your cruise to receive the offer. *Discount is applicable to base cruise rates only and is not offered on the taxes, fees and gratuities of $285 per person. The entire cabin must be paid in full to receive this discount. The Paid in Full Discount expired Monday, April 30, 2018. All deposits are based on a minimum of two (2) guests per cabin. Click Here for the full payment schedule. If You Do Not Show Up For The Cruise On Time, or Do Not Otherwise Use Your Ticket: There will be no refunds given. The main passenger on the reservation must fill out, sign and submit the form BEFORE the cabin will be canceled. Once filled out and signed, please scan and email to: reservations@monstersofrockcruise.com or fax to 1-954-417-6264. The date the form is received will be the date of cancellation. No exceptions will be made and this process must be followed (unless the cancellation is done by On The Blue for failure to pay or other reason(s) within our discretion). Please note the cancellation provisions of these Terms and Conditions apply to the Cruise, regardless of any representations made by Royal Caribbean Cruise Line, whether in its passenger contract terms or elsewhere. All rights granted to passengers in the Royal Caribbean Cruise Line contract relating to the payment or refund of cruise fare and to cancellations by passengers shall not apply to you or be operative. There will no refunds given for those who do not show up on time, unused tickets, or after the Cruise has occurred. Please note the cancellation provisions of these Terms and Conditions apply to the Cruise, regardless of any representations made by Royal Caribbean, whether in its passenger contract terms or elsewhere. The rights granted to passengers in the ROYAL CARIBBEAN Cruise Ticket Contract relating to the payment or refund of cruise fare and to cancellations by passengers are superseded by these Terms & Conditions, and shall not be applicable. CAN I MAKE CHANGES TO MY RESERVATION OR TRANSFER MY CABIN TO ANOTHER PARTY? Yes. However, the passenger who places a reservation for a cabin on board is considered the cabin’s “Primary” passenger, and is therefore solely responsible for initiating or authorizing changes to the reservation and/or cabin transfers. Please make note of dates and fees associated with changes and transfers below. The main passenger on the reservation must fill out, sign and submit the form before ANY changes to the cabin will be made. Once filled out and signed, please scan and email to: reservations@monstersofrockcruise.com or fax to 1 (888) 959-1709 or 1 (954) 417-6264. The date the form is received will be the date of changes. No exceptions will be made and this process must be followed. No transfer or change of a reservation to a NEW passenger shall be made without On The Blue’s prior written approval, to be given or withheld in On The Blue’s sole discretion. Subject to the preceding sentence, under no circumstances shall a Passenger or any person or entity acting on Passenger’s behalf (i) sell a reservation, cabin, or berth to any other person or entity for more than the price paid by the Passenger, or (ii) offer the reservation, cabin or berth to any other person(s) or entity(s) as a prize or award in a drawing, contest, lottery, sweepstakes, raffle or similar event of any kind; a transfer in violation of this sentence shall not be permitted, and the Primary passenger shall indemnify and hold harmless On The Blue from and against any damages, losses and claims suffered by On The Blue as a result of a violation by Primary passenger, or any other passenger listed on the reservation, of this paragraph. If a Primary or other passenger wishes to transfer the reservation, cabin or berth to a NEW passenger, the Primary passenger shall send a request in writing for approval of this transfer to On The Blue, along with (i) the reason for the requested transfer and a statement that the transfer will not violate this paragraph, (ii) the NEW passenger name, and (iii) a completed ROYAL CARIBBEAN Passenger Contract for the NEW passenger. If the request is approved by On The Blue, the NEW passenger must make full deposit payment amount due based on the due dates listed in the Terms and Conditions. Once that payment has been made, then the applicable amounts paid by the ORIGINAL traveler will be refunded directly to the original traveler. Any NEW passenger sailing with a reservation transferred to him/her in violation of this paragraph may be denied boarding by On The Blue or, in On the Blue’s sole discretion, removed by On the Blue from the Cruise at any port, at such NEW passenger’s sole cost. Each cabin will be entitled to one (1) complimentary name change (excluding Primary passenger) or passenger addition, for second, third or fourth passengers, upon request in writing to Monsters of Rock Cruise. Any Additional changes prior to May 30, 2018 will be assessed a $50 fee for each occurrence. Any changes made to a reservation between May 31, 2018 – August 28, 2018, including but not limited to, the addition of any guest not currently listed on the reservation are $100 per change. Any changes made to a reservation between August 29, 2018 – December 4, 2018 including but not limited to, the addition of any guest not currently listed on the reservation are $150 per change. Any changes made to a reservation between December 5, 2018 – January 23, 2019 including but not limited to, the addition of any guest not currently listed on the reservation are $250 per change. All reservation changes (name changes and transfers) must be submitted in writing by the Primary passenger using our “Reservation Change Request Form.” Change forms must be submitted by 5:30 pm Eastern by the above deadline dates. To request a form, please email us at reservations@monstersofrockcruise.com. The date that such written notice of change/cancellation is received will determine the applicable change fee/cancellation fees per the above schedule. No exceptions will be made. We do not automatically process your next payment for you, it is your responsibility to make your payments by the due dates. You can make a payment at any time by either calling us at (855) 505-6672 or by using the “PAYMENT LINK” located in your confirmation emails. CAN I GO ON THE CRUISE IF I’M PREGNANT? Pregnant women are highly recommended to seek medical advice prior to travel at any stage of their pregnancy. Women who are up to 23 weeks pregnant at the end of the cruise are required to produce a medical certificate of fitness to travel. Women who will be 24 weeks or more at the time of embarkation for health and safety reasons are not allowed to sail. RCI reserves the right to request a medical certificate at any stage of pregnancy and to refuse passage if the Carrier and/or the Master are not satisfied that the Passenger will be safe during the passage. 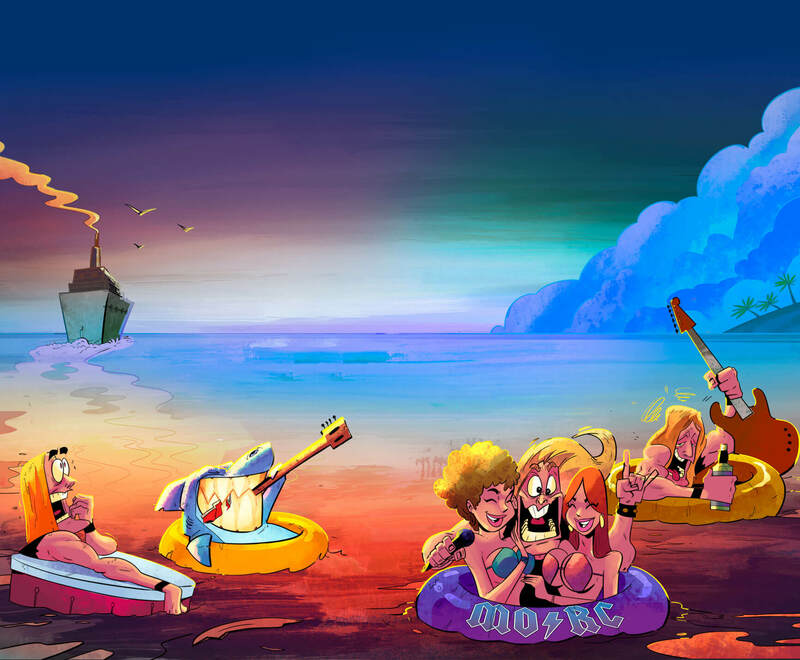 As stated in the Terms and Conditions, due to the nature of this event, all payments and deposits on The Monsters of Rock Cruise are NON-REFUNDABLE and therefore, we highly recommend travel insurance. 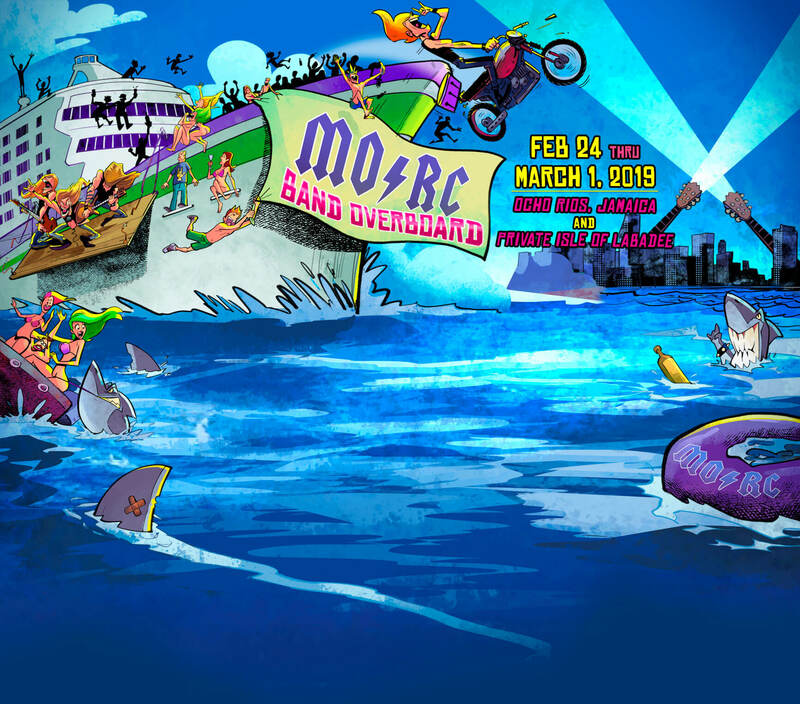 Travel Insurance is NOT included in your Monsters of Rock Cruise Reservation. The purchase of insurance is the sole responsibility of each guest sailing and is NOT offered through The Monsters of Rock Cruise. It is up to each guest to research and decide on a 3rd party vendor of their choice for insurance. OTB Cruises, LLC and The Monsters of Rock Cruise are not responsible for any losses, including any and all deposits, due to lack of travel insurance.